Rio Tinto Plc, the world’s second-biggest mining company, won dismissal of a lawsuit in the U.S. accusing it of contributing to genocide in Papua New Guinea. The U.S. Court of Appeals in San Francisco today affirmed a lower court’s ruling dismissing the case. The appeals court’s decision was prompted by an April 22 order by the U.S. Supreme Court, which in a separate case brought against Royal Dutch Shell Plc (RDSA) had scaled back application of the 1789 Alien Tort Statute. That law, also invoked in the Rio Tinto case, has been a favorite tool of human-rights advocates seeking to hold companies responsible in U.S. courts for atrocities overseas. The lawsuit against London-based Rio Tinto stems from the deaths of thousands of indigenous people starting in 1988 on the island of Bougainville, where Rio Tinto was part of a group operating the world’s largest open copper pit. POLLUTION from the Ramu Nickel Project is already affecting the environment. A marine expedition conducted in Madang last year has also revealed that there is marine life below the depth of 150 metres at the waters in Basamuk Bay. 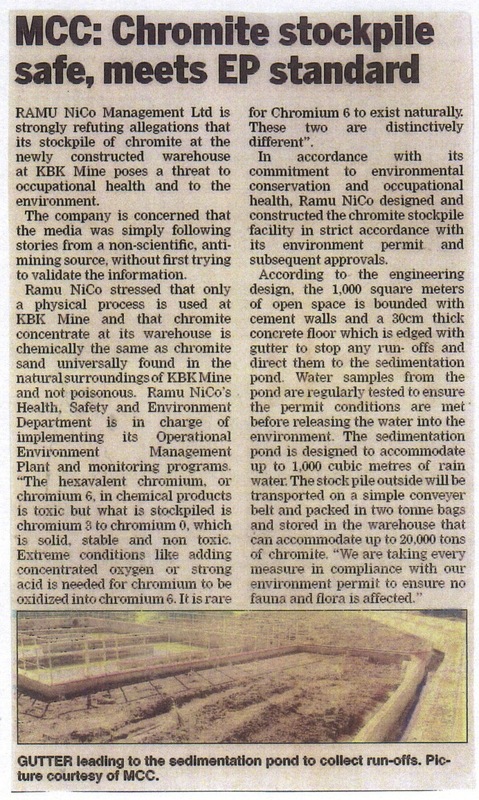 This is contrary to earlier suggestions in relation to the multi-million kina Ramu Nickel Project, that no marine life existed below this depth that would be affected by the mine tailings that would be discharged into the waters. The findings were revealed by a Frenchman, Professor Philippe Bouchet, and Head Scientist of the Marine Biodiversity Expedition which was conducted in the Madang waters, including the Madang Lagoon and the Bismark Sea. The deep sea component of the survey had been conducted by a team of marine biodiversity scientists in December and on board the expedition vessel Alice. Professor Bouchet said they had covered the Bismark Sea extensively and out of curiosity they had decided to also survey the area in front of the refinery including the canyon in the Astrolabe Bay where the Chinese project developers had sought approval to have the mine tailings discharged into. Prof Bouchet said it was visibly evident that the environment there was already affected by the mine tailings. He said it came to him as a surprise that no survey had been conducted in the area before the opening of the factory. He said he had heard there were suggestions, including in the court in the country, that there was no marine life below the depth of 150 metres. He said biologists knew this not to be true, and this had been confirmed when they carried out this exercise. 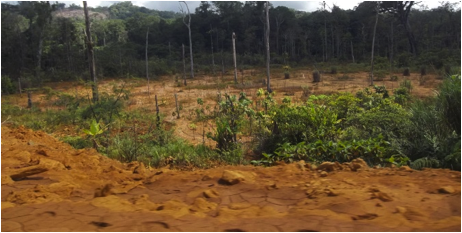 They said they had discovered, a week after the Ramu Nickel Project was officially commissioned, in front of the refinery, a deep sea community called Cold Seeps; and that the area was covered in red mud. “Clearly the factory had started way before the project opening. 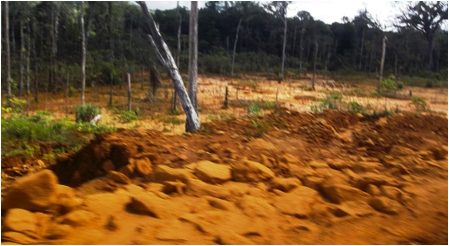 The tailings has already impacted the area as everything is carpeted in red mud at depths of 800 metres,” he said. However, he said what was also even more shocking was the discovery of the amount of garbage even at depths of 1000 metres. “The amount of trash that was collected after just half an hour was a shock,” he said. He said this to also be the case for the Madang Lagoon, which in comparison to the Bismark was shallower, where people swam and fished in. “This area is no longer as pristine, with the amount of cans, old fishing nets and a lot of other garbage that had been dumped into the sea. “Why should this be a worry? You should be worried with the kind of ooze that is now at the bottom, which has also been caused by the influx of rain water charged with sediments,” he said. He said they had also discovered there to be a lot of sunken logs and wood in the lagoon. He said while this was more than expected and was suggestive of an increase in logging and extenstion of plantations. Another significant finding which he said is contained in the interim report, for which he had travelled into the country to present to those involved in the expedition, including local authorities, was the fact that some species whose habitats could be found, were missing. He said he had developed a hypothesis that this was related to the coral triangle, but added that this would need to be tested in another expedition which they were planning to carry out in Kavieng. He revealed that a scientific publication on the expedition would be forthcoming. The expeditions goal, among others, was to document new discoveries of marine species and had involved a total of 139 participants from 20 nations and 40 institutions including the University of PNG. Good news for hundreds of Emperor Gold Mine workers who were made redundant in 2006 as they will now be paid for the pending redundancy payments. This comes after the Fiji Court of Appeal in a unanimous decision, ruled out the appeal against an earlier decision of the High Court, upholding the awards of the Emperor Tribunal. General Secretary of the Communications, Mining and General Workers Union, Attar Singh said some workers have left the country and some have passed away, but their families who are the beneficiaries will receive the money. Meanwhile a branch meeting will be held at Tavua Club this Saturday on the details of the payment. This is the mine’s rubbish dump situated by the roadside before the entrance of the mine. The foul stench emitted is quite overwhelming (even from where I was standing to take the picture) and birds and animals scavenge the site for food. There is no fence around the perimeters of this site. The mine site showing excavator digging through rock and soil, the trees in the background will all be cleared. Locals mentioned the trees have been cleared and left to rot by the mine site. Madang timbers have now cashed in on the opportunity and are collecting felled trees along the mine site for free. 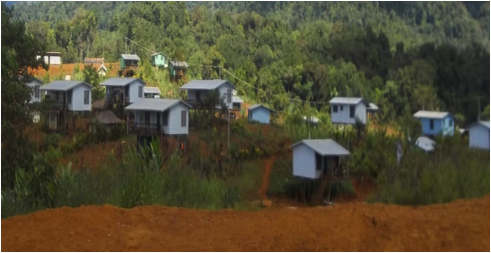 Here shows the Enekuai resettlement homes built for the displaced people of KBK. Thirty (30) or so houses further back of the settlement have no access to water or electricity. And here is the mine’s water supply plant. This is before Enekuai settlement looking back towards the mine site. As Nautilus Minerals gets set to present to its shareholders, concerned citizens from Papua New Guinea, Canada, and Australia continue to question the viability and environmental risks of the company’s controversial plan to build the world’s first deep sea mine. Nautilus is in a dispute with the Papua New Guinea Government over the financing of its Solwara 1 project, resulting in the suspension of the project in November last year. With its share price sinking from over $2 to well under C$0.50 the viability of Nautilus’ venture is being called into question. The Solwara 1 project in Papua New Guinea has stimulated widespread opposition from many sectors of PNG society – from scientists, students, university lecturers, church leaders, and members of local coastal communities. The Deep Sea Mining (DSM) campaign has released two reports highlighting flaws in Nautilus’s EIS of its Solwara 1 project. Dr. Catherine Coumans, MiningWatch Canada, said, “The EIS should have provided the basis for identifying risks and the development of strategies to manage them. Nautilus’s Solwara 1 EIS fails to do this. The many errors and omissions in the modelling and analysis of data means that the EIS underestimates the risks to local communities associated with Solwara 1. The liabilities to shareholders may be significant. COPPERMOLY marked yesterday as “a significant turning point” for the company after it sealed a $5 million deal to take full control of three mining tenements in West New Britain. 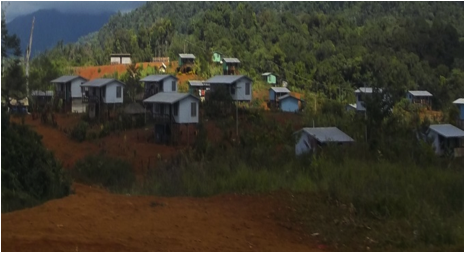 The deal will give Coppermoly immediate access to the Papua New Guinea tenements, one with a 40 million tonne copper resource. The Gold Coast-based junior minerals explorer announced it had entered into an agreement with Canadian mining giant Barrick to re-acquire Barrick’s interest in the tenements. Coppermoly has been working since late last year to stitch up financing arrangements to fund a buyback of the Nakru, Simuku and Talelumas tenements from Barrick, which earned a 72 per cent stake through a farm-in deal. The $5 million acquisition will be funded in three tranches, with payments staged over five years. Coppermoly said the acquisition was conditional on it raising $2 million by August 14. Coppermoly will place 3.7 million fully paid ordinary shares with underwriter Jelsh Holdings, at an issue price of 4.5c, to raise just over $166,000. Jelsh Holdings also has agreed to underwrite a 1-for-4 non-renounceable offer to shareholders at 4.5c a share to raise a further $1.95 million. The funds will be used to make the $2 million first payment to Barrick and will allow Coppermoly to begin exploration activities on all three tenements. 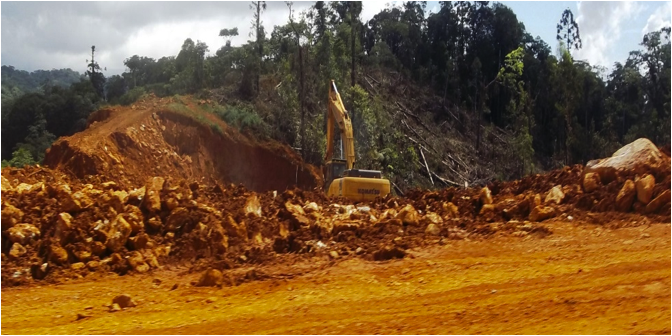 “This is a fantastic outcome for Coppermoly to re-acquire 100 per cent of the West New Britain project, and importantly, regain control of the exploration activity,” Coppermoly managing director Maurice Gannon said. “Barrick has spent well over $20 million acquiring its interest in the project (so) for Coppermoly to re-acquire 100 per cent of the project for $5 million over five years is a significant achievement,” he said. Mr Gannon said the share placement would be fully underwritten at a 50 per cent premium to the current share price, which was “a remarkable achievement in the current market”. He said Jelsh Holdings’ Australian representative was a PhD-qualified geologist who had worked for BHP and was a conduit to major Chinese investment funds. Coppermoly shares are up 16.67 per cent to 3.5c.